1. Want to listen to singing sand? Check out this press release to find out more or just listen to the singing in the video posted below. 2. Wilson da Silva, Editor-in-Chief of COSMOS magazine, wrote this fabulous read. Who would have thought that an earthquake in Indonesia would result in a great work of literature on the other side of the world? It’s like the opposite of the “butterfly flaps its wings…” concept. 3. Out of the social media around Hurricane Sandy came the conversation about fake photos of sharks on the streets of New York and the Statue of Liberty being engulfed by waves. So this piece analysing the ability of twitter to verify information was an interesting case study. 4. We’ve known for some time that mothers carry the DNA of their children in their bodies. Now they’ve found mothers can carry the DNA of their sons in the brain. This article is a great trip into the backstory of fetal DNA in mothers. 5. I know I shouldn’t finish on a depressing note BUT the fish at Fukushima are still radioactive and could be that way for decades. This entry was posted in Great Reads, Uncategorized and tagged Singing sand on November 2, 2012 by Julie Milland. Eva Dimitriadis spoke with Science MoJo about some of the nuts and bolts of a science career. She goes through why she chose a career in science and, in particular, her field of women’s reproductive health. Eva runs a lab at Prince Henry’s Institute in Melbourne and specialises in the biology of pregnancy. This entry was posted in Health, Scientist Profile, Scientist Profile, Video, Women's Health and tagged Reproductive health, Women's Health on October 28, 2012 by Julie Milland. 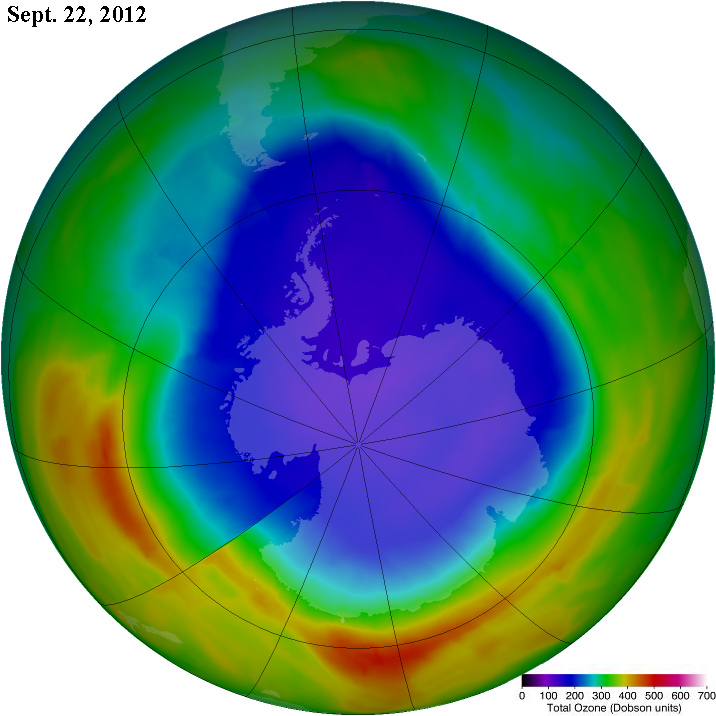 The ozone hole: an environmental success story? NASA has just reported that the ozone hole over Antarctica is the smallest it’s been in 20 years. On September 22 2012, the ozone hole reached its maximum seasonal size for the year of 21.2 million square kilometres, which is the same size as the USA, Canada and Mexico combined. This size is down from the maximum size of 29.9 million square kilometres reached in September 2006. There isn’t much talk about the ozone hole these days but it was often in the news in the 1980s, just as “climate change” is in the news now. Ozone in the atmosphere helps to protect the Earth from ultraviolet (UV) radiation. As we all know, increased exposure to UV causes skin cancer. In the 1980s when the ozone hole first appeared, the fear of an expanding hole in our protective shield was not good news for Australia, given our proximity to Antarctica. This entry was posted in Controversial Issues, Earth Science, Environment, Opinion/Explainer and tagged Antarctica, Chlorofluorocarbon, Montreal Protocol, NASA, Ozone depletion on October 25, 2012 by Julie Milland.